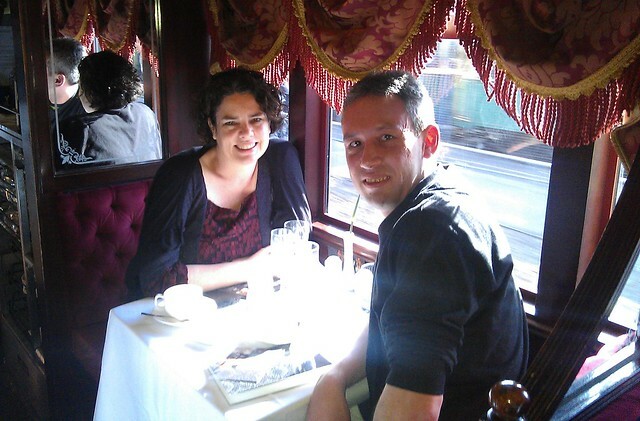 It was actually a present from my last birthday: a lunch on the Restaurant Tram. On boarding we found the appetisers already on the table, and ordered the entrees and mains (a choice of two possibilities for each; all including meat — it seems you have to notify them in advance if you want the vegetarian option). Champagne and wine was forthcoming — I’m not much of a drinker, but whatever plonk they were serving was very nice. Marita and I swapped the food around so we got to try everything. After the mains there was a cheese platter with tea or coffee (and an option of another after-lunch drinkie — we both chose Bailey’s) and a couple of little chocolates to polish it all off. All the food was very tasty, and while perhaps on its own (eg in a conventional restaurant at this price) it wouldn’t win any awards, with the great service and the novelty of the experience it made for a very very satisfying meal. And the route? From the Normanby Road starting point, the tram went north up Spencer Street, east along Bourke Street, along Spring/Nicholson Streets, then west down Latrobe Street, turning south down William Street, along Kingsway, then into St Kilda Road. From there we rolled down to St Kilda Junction, along Fitzroy Street and The Esplanade, and all the way down to the end of Acland Street. From there we went back along The Esplanade, into Fitzroy Street, but then reversed into Park Street, following the 112 route back in towards the City. In Albert Road we manoeuvred out of the way to let a service tram overtake, then continued on north along Clarendon Street. We reversed again at the casino, and then headed a short way down the 109 light rail, just past Southbank depot where we once again reversed back to the pickup point again, arriving just on 3pm. We didn’t see the other trams in the pack until we arrived back, so I assume they must have taken other routes around the place. After all, on a tram network the size of ours, there’s plenty of possibilities. The tourists and locals dispersed, and Marita and I strolled back to Southern Cross to catch our trains home, a little light-headed and very full. 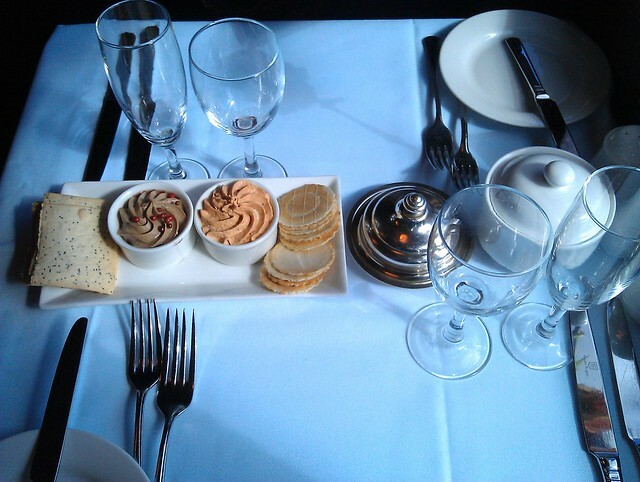 I’ve got to say, it felt very civilised rolling along the street with all that good food on the tram. I’d definitely recommend it. 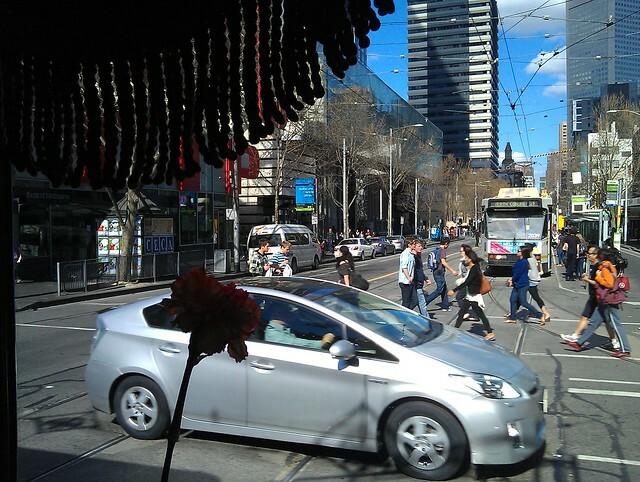 ← Previous Previous post: If Melbourne didn’t have trams, would every CBD street look like Lonsdale Street? You’ve made us both very jealous! 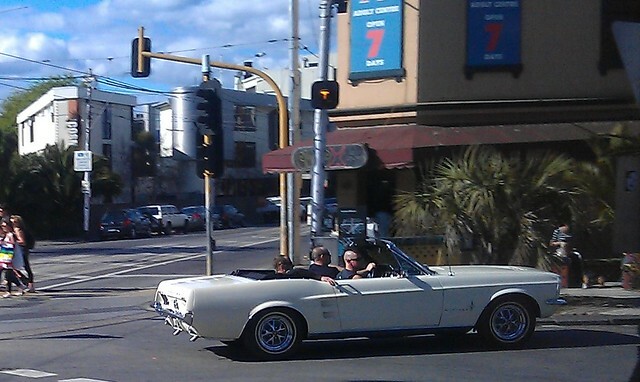 I know our journey headed off down to St Kilda Junction first. I ended up giving an unintended commentary about where we were going, leading some other diners to ask how long I’d lived in Melbourne. It was one of the greatest honours I’ve ever had bestowed upon me, to be mistaken for a Melburnian! After that, the inclusive booze bagan to have an effect and I’m not sure what happened then, although I do recall a pause at Albert Park. I didn’t know they did it in the daytime, too; perhaps that’s a more recent innovation? Anyway, it’s the most civilized way to sightsee I know. Happy birthday again! Damn! I was going to make a Myki joke, but you anticipated too well at the end! Did either of you get motion sickness – eating, drinking in a moving vehicle? Sounds a great experience and well reported and photographed. I’ve done it twice, once with the early dinner, and once with the later, longer 3 hour dinner. I highly, highly recommend the 3 hour dinner, but make sure you are starving prior as it’s very big (5 courses). I rang out of the blue a few days prior to my partners birthday which was on a Saturday night, and obviously the chances of getting an ad hoc booking so close are almost impossible. However the booking staff were very accomodating and rang me back the next day about a cancellation so we did the full 3 hour trip on a Saturday night which was just magical. Staff were all wonderful. My partner was Vego and was perfectly catered for, though as Daniel said you do have to give them noticed (which is fair enough considering the size of that kitchen!). When we did it , it was dark, and I quickly lost track of where we were, no matter how hard to tried to concentrate. Conversation, food and wine and who cares where they are. 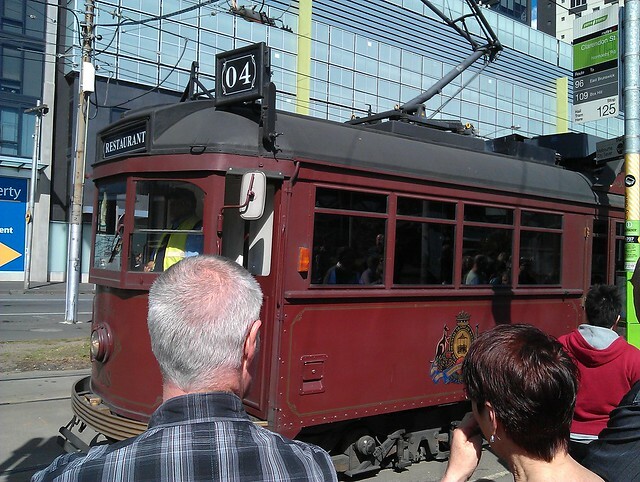 This just makes me even more keen to take a trip on the restaurant tram one day. Thanks for sharing your experience. @malcolm, very unlucky to feel unwell! I didn’t get any kind of twinge of motion sickness (though I have suffered it before while trying to read in a car or bus, for instance). Thanks for flagging the photo. Whoops. Fixed now. I’ve been on it twice – did the early dinner a couple of years back then more recently the late dinner. Enjoy the novelty of having the kangaroo entree trundling through the city/South Melbourne/St Kilda. The last time I was on the three trams operating pulled up at their usual place alongside Albert Park and one of the staff was showing us a rather freindly possum that regularly shows up at the same time. @Roger – stabilisers are fitted to the trams so it is actually a smooth ride – you don’t really feel it moving much and no red wine spilt everywhere! For some reason I’d always assumed the food was going to be pretty ordinary on the restaurant tram. A warning from my dad “never trust food that comes from a moving kitchen” perhaps haunting me. Now I’m seriously considering booking this for myself sometime, although Venice does have a tendency to get a bit motion sick, so perhaps it wouldn’t end up being very romantic.